The freezing toilet is a clean, hygienic solution that is easy to install anywhere. 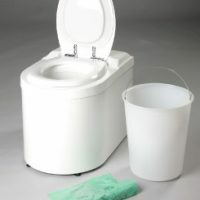 It is ideal as an back up toilet as the freezing toilet does not need a vent pipe or liquid outlet and therefore it is portable and can be used anywhere there is AC power. How does a freezing toilet work? The freezing toilet works virtually like a home freezer. The urine and solid waste are frozen solid at about -15 degrees Celsius and collected in the compostable bag. There is no smell from the waste because as soon as it hits the base of the toilet the waste is frozen quickly. There is no liquid or air outlet from the unit so can be easily installed anywhere. The unit is comfortable to sit on a gently heats the room like a normal freezer.